22 mm stainless steel case, stainless steel bezel with Bulgari logo, sapphire crystal, dark mother of pearl dial with 12 diamond hour markers, quartz movement, black calfskin strap, deployant buckle. Water resistant to 100 ft.
22 mm stainless steel case, stainless steel bezel with 28 diamonds, sapphire crystal, white dial, quartz movement, stainless steel bracelet with bangle style medium length, clasp buckle. Water resistant to 100 ft.
22 mm stainless steel case, stainless steel bezel with Bulgari logo, sapphire crystal, black dial with sun and moon motif, pink gold moon inlay set with diamonds, pink gold rimmed sun inlay with white gold center, quartz movement, stainless steel bracelet with bangle style medium length, clasp buckle. Water resistant to 100 ft.
22 mm stainless steel case, stainless steel bezel with Bulgari logo, sapphire crystal, silver dial with a fine sunburst texture and a steel inlay motif of 3 hearts, quartz movement, stainless steel bracelet with bangle style medium length, clasp buckle. 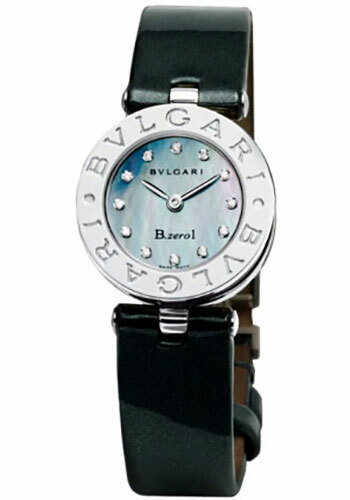 Water resistant to 100 ft.
22 mm stainless steel case, stainless steel bezel with Bulgari logo, sapphire crystal, white dial with a flower motif, 1 polished steel rimmed flower with mother of pearl inlay center and 1 pave diamond set flower, quartz movement, stainless steel bracelet with bangle style medium length, clasp buckle. Water resistant to 100 ft.
22 mm stainless steel case, stainless steel bezel with Bulgari logo, sapphire crystal, white mother of pearl dial with polished steel inlay butterfly motif, center butterfly set with 4 diamonds, quartz movement, stainless steel bracelet, clasp buckle. Water resistant to 100 ft.